Whitening toothpaste is great for removing superficial surface stains, but it won’t actually change the color of your teeth. A great analogy is a wall that was painted an off-white color many years ago but has since been stained with fingerprints, grease and scuff marks. You can scrub the wall clean to give it a much cleaner, brighter appearance. But to change the color of the wall to a brighter shade of white, you have to re-paint it. Similarly, with consistent use, a whitening toothpaste will remove all the stains that sit on top of your teeth and help them appear brighter and whiter – but it won’t actually change the shade of your smile. Having said that, one thing that whitening toothpaste is great for is maintaining your results after professional whitening! In many cases, patients will spend money on several over-the-counter whitening products without getting the result they hoped for. 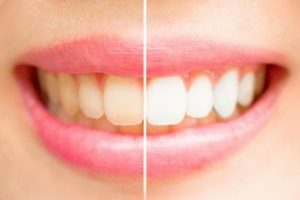 Many people have a deeper level of discoloration or staining, so whitening toothpaste or strips don’t provide them with the results they’re after. That’s where professional whitening treatments come in. A professional whitening treatment works on the deeper layers of your teeth and will make them 6-10 shades whiter. That’s because professional-strength gel is much stronger than any over-the-counter whitening product since the FDA limits the concentration of whitening ingredients in these products. In addition, a professional gel is used in conjunction with custom-made trays so that it’s snugly in contact with every part of the teeth. These two factors, combined with the professional oversight of a cosmetic dentist in Newark, mean that a professional treatment will give you the results you’re after – the first time! As a general and cosmetic dentist in Newark, Dr. Donald Bond loves to help his patients achieve the smile they’ve always wanted. He’s found that whitening is one of his most popular cosmetic procedures because it’s fast, easy, and delivers fantastic results. If you’d like to whiten your teeth and have any additional questions, he can be reached via his website or at (302) 731-4225.